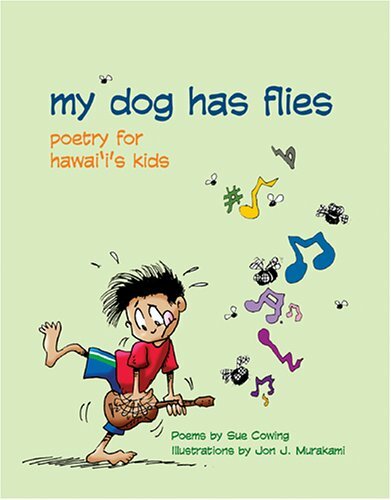 The first poetry book with local themes and characters Hawaii's kids cna relate to. Kids will love the rhythm and rhyme and will want to read and hear the poems read over and over again. A fantastic source for teachers and parents to introduce kids to poetry and get them excited about reading: wonderfully illustrated with energetic, quirky, funny sketches by Jon J. Murakami. You're invited to a place where elephants run loose in tall, waving grass; where a kid can easily speak mongoose; where friends see you without any flaws; and where the teacher thinks you're the best student yet. Mynah birds sing and cocqui frogs scream. A boar learns how to add two plus two, and a girl catches her very first wave. So, lie on your back, drink in the sky, and let your imagination roam through the poetry of a child's life in Hawaii.